It has been several weeks now since I was in India with Shilpa and her family, and yet I remember the experience as if I was still there now. India is by far the most foreign place I have ever been to. I was expecting a different culture, but somehow what I had seen in pictures and movies did not in any way encompass what it was like to be there, living, for three weeks. I was really hoping, beforehand, that working with DSF in Bangalore would work out, but I didn’t really know what to expect. 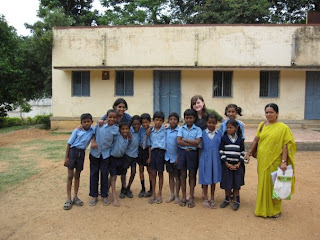 When we met with Maitreyee and Bhagya that first day they told us that we would in fact get to help with a class, and maybe even teach them ourselves. 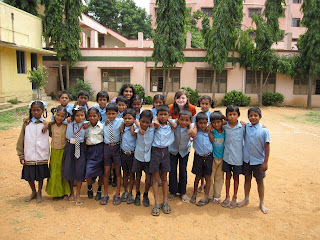 Our first morning at the Rajajinagar school was very intimidating for me. I felt as though everyone was staring, both kids and adults. The school, we were told, was a good government school, it was well established and DSF had a history working with it. And yet what I saw that first day of the school was worlds away from the public schools here in New York City. We met the class we would be with every day. I was afraid communication with them would be impossible, that they wouldn’t listen to me. But by the time we had left that day all my fears were gone. We had checked their work and helped them fix the mistakes they had made with their English and I had loved it. I was excited to go back the next day, and every day after that. Bhagya was extremely helpful; I really want to thank her for the opportunities that she gave us in the classroom. She was so kind, so good with the kids, and really made us feel comfortable. Over time she gave us more freedom with the group we had gotten to know, and let us teach them by ourselves which I loved. It was extremely difficult at times, because the language barrier was not little, but I feel like I learned a lot about communication, and the levels it can go to beyond just language. Every day brought new challenges but most of all I was continually impressed by the enthusiasm of the kids for learning. 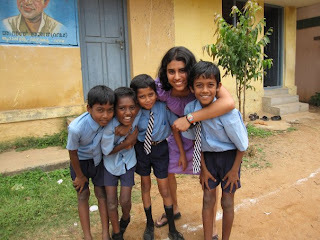 After the first week, Shilpa and I felt frustrated by the way we were teaching. 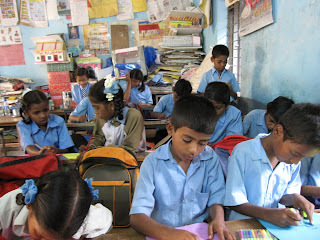 We watched some of the kids’ other classes, and what we saw more than anything was an emphasis on rote learning. We tried to implement this when we taught them, but found it very ineffective. It is such a different way of learning than what we have here in America. Here everything is based on how the kids feel, about interaction and fitting a way of learning to the individual. So we thought we would try to bring some of that to them. We took our class out to the courtyard and talked. We taught them, “This is a __” and the concepts of “Here” and “There.” We did “Big and Small” and the colors. It felt like teaching them English in a way that they could use every day, with familiar objects, was much more effective and useful to them. I hope they felt it was as well. It was also more fun. The kids really enjoyed it, and I did too. I feel like in the days we took them outside, the barriers came down. They were just kids, and they could have been from anywhere. That was incredible for me to see. Before that point I had been so bogged down by observing such a different culture, that it was refreshing to catch a glimpse of the things that transcend cultural boundaries. We had them draw pictures of animals and of themselves which I now have up on my wall, and I was struck by their creativity. They are funny, bright, lovely kids and I really miss them. I think that this experience has given me a glimpse into the type of work I would like to do in the future. It was a very special experience. Talking to Maitreyee, Sabu and Lata the last day was amazing. I have always taken education and the opportunities it gives me for granted. 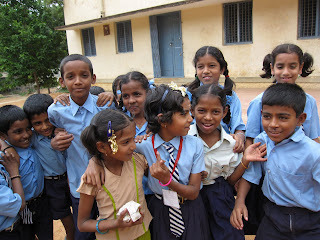 I saw firsthand in Bangalore, with the help of DSF, what a gift it is. I so admire what DSF does, and what an incredible program it is. Being in DSF office it really felt like every person there was there because they wanted to be, because they cared, and that was an incredible atmosphere to be in, even for such a short period of time. Being in India was truly incredible. However I felt that despite all I saw that w as different and new, I was still in a very sheltered environment because I didn’t have a direct connection with any of it. But being in the school every day, getting to know the kids and the surroundings and to be involved in a tiny piece of life there, it really hit me what a different culture I was in. I found myself thinking a lot about what the kids in our class went home to every night, what their families were like, what they did after school every day. I feel like I learned more about the world somehow, in those few days, than I ever have before. Maitreyee pointed out that whatever we got out of the experience would be very important and special, both for the kids and for us. That idea is really important when I think about my time at the Rajajinagar school. One of the most critical things I learned is that being involved - even if its only in a small way, like helping a class of children for seven days - can help people, and can teach you lessons you never have gotten otherwise. Thank you for your generosity in giving me this unforgettable opportunity. I was inspired by your work there, and I truly hope that I can continue helping the Dream School Foundation in whatever way I can. THANK YOU! 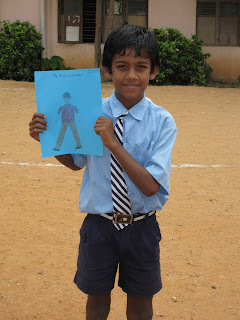 When I first started at the Rajajinagar school, I had no idea what to expect. I had been to India many times, I had even lived there and attended school for a couple of months when I was a child, but in all honesty I had never seen India outside of the middle class family that my family is from. For me, the two weeks that I spent at the school in Rajajinagar was really an eye-opening experience into a beautiful school with students who all had something special about them, and I am truly grateful to have been given the opportunity. Beauty is not only defined by appearances, but also by what lays within. Coming from a school with a large audi torium, I found beauty in the fact that the students in Rajajinagar conducted their assemblies on a dirt courtyard. It made me realize how much I take for granted in my life. The idea that all the students would physically pitch in for bringing the lunch everyday strengthened the community and dependence on one another. While teaching the fourth and fifth standard class, I found beauty in the fact that the students would share their erasers and sharpeners with one another. All of these acts of childhood made me realize that these students were just like any other students across the globe, and that they deserved the opportunity to learn, just as any other child does. On our first morning in the school, I was not taken aback by anything that I saw. I had mentally prepared myself for a school that was very different to mine in New York City, so I wasn’t even surprised when the kids stood up and chanted “Good Morning Ma’am” when we entered the room. What I was surprised at however, was the method that they were being taught by. The first morning in the school was meant to be an observing day, and still in the midst of taking in the new experience, I let myself give in to the methods by which the students were being taught English. They were learning English by memorizing the spellings of different words (i.e. that A-P-P-L-E spells Apple), except they were learning this without having any idea of how to read. At first I accepted this, and for a week we taught the students spellings, and then would conduct dictations at the end of each lesson. While all of this was going on, in my head I would characterize the student who could remember the most spellings as the best student. However, when we gave dictations the next day, students would hardly remember the spellings of the words they had learned the previous day. After a week of seeing this failing routine, we came to the conclusion that through conducting dictations and teaching the children spellings, we were not helping them learn English in any way. One thing that really impressed me was the way that students would help one another. Hardly speaking a common language with the kids, I found it amazing that the students would collaborate and help each other try to make sense of what I had just said in English. 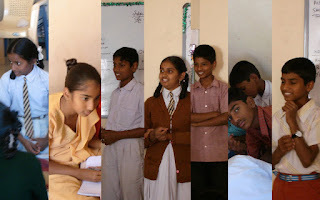 Through my broken Kannada and their minimal English, I realize that communication exists on a much deeper level than language, and in our scenario, could only be successful if care, compassion, and a drive existed in the classroom. It certainly did because instead of giving up on our alien tongue, the students would work with one another and help each other until everyone understood the message that was trying to be passed. At first, I was very worried about communication barriers, but after seeing the collaboration amongst students, all of those fears went away. The second week that we were there, we made a very dramatic transition in the way we approached the teaching. It started with me saying, “Please put your books inside your backpack.” After I said this, I remember most of the students looking very confused, either because they could not understand what I had just said, or because this is something that they had never expected to hear in a classroom setting. I found solace in the fact that some students would help their classmates understand what I had just said by translati ng it for them into Kannada. We took the children outside and showed them objects that appear in their life everyday. We taught them the difference between “big” and “small”, between “here” and “there”, we taught them different colors, and the names of different objects that they see everyday. This way of learning is very similar to the way that I not only learned in America, but also to the way I picked up whatever little I can speak of Kannada. The idea of learning about objects and how to say things that are interesting and relevant to my life is to me more important and better engrained into my memory. The students were enjoying being outside, and the next day when we tested them to see what they could remember, they remembered many more of the objects and concepts than they did when we had tested their spelling. Not only was I able to feel more productive the second week (in terms of what we had taught them), but during this week I felt a much stronger connection to the kids. They realized that as two teenage girls, our methods of teaching as well as our personalities were more liberal than what they were used to, and after taking the students for an interactive walk around their campus, the students started becoming less shy, and more open with us. By seeing the amount that they enjoyed learning new words, and things around them, I realized that the conclusions I had made earlier, that the student who could memorize the most was the best student, was wrong on so many levels. I realized that all of the students have a drive to learn, but some are just better than others at adapting to dull methods. During this week, personalities and talents came out, and the students felt more like children, learning English through drawing pictures and talking with their classmates about what they were doing. They are all such talented, caring, and beautiful children, many of them just needed a platform to show it. Leaving on the last day was very sad because I was enjoying my experience there so much, but I was so thankful to have had the opportunity to work with DSF. I am especially grateful to Maitreyee, for organizing this amazing opportunity, and to Bhagya, for always helping us teach, and making me feel very safe and comfortable within the school. I am also extremely thankful to the Rajajinagar school for having us and looking after us for two weeks. Thank you, DSF, for an unforgettable experience. After working in the Rajajinagar school, my perception on the world around me changed greatly, and has made me realize a lot about the world that I live in. I find your cause extremely valuable and important, and hope to continue helping it in all ways possible.